For those of you who have followed TALAS from location to location around Manhattan know that we have perpetually been on the hunt for bigger & better warehouses to best suit our needs as the company has continued to expand over the years. While we loved our last location on 20th Street in Manhattan, it only took us 4 short years before the space was completely outgrown. 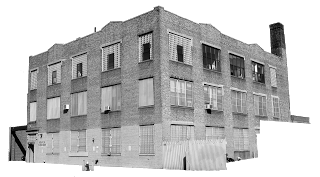 After looking for a new space for our business in one of the outer boroughs of NYC for over 1 year, we found a building that fit the bill: 330 Morgan Avenue, Brooklyn NY. The existing owner of the building ran a feather & down company: making custom pillows, blankets, and other items filled with feathers. Here, we’ll help you imagine what this place looked like only a few months ago! This lasted many months, and like most renovations, our moving date was postponed so many times that we’re sure some of you began to question if this move was in fact a reality! Needless to say come April 2009 the building was ready, and we took the much anticipated leap across the East River to become true Brooklynites. Then came the move… “The Move” of epic proportions spanned 3 full weeks, and involved running four 26′ trucks back and forth between two locations on Mondays, Wednesdays, and Fridays. On the intermediary days we spread our crew out on both fronts: 1 crew absorbed the inventory at the new location, and the 2nd crew continued to pack and break down the 20th Street location. During the first week and a half we stayed operational, with the office staff taking orders and the warehouse staff juggling between packing up the “house” and packing orders. Towards the end things starting getting chaotic… running nearly around the clock, taxing the old unreliable freight elevator on 20th Street, pallets nearly toppling over, and other fun stuff! When the dust settled it felt as if we had moved mountains, and when you figure that we moved about 60 trucks worth of inventory, many would say we did! Everyone literally got their hands dirty in all aspects of the move (see image to the right: case & point). For those of you who have never met this gentleman before, this is Jake Salik, the proud owner of TALAS for 17 years! We have yet to encounter a job Jake won’t rise to the challenge of. Needless to say, you should certainly come and pay us a visit at our new location in Brooklyn! always nice to see the boss get stuck in..
Wow, happy to see you guys doing so well. New place looks great, nearly as good as Falkiners! Good luck to you all from Shepherds Bookbinders. TALAS | Articles | TALAS News | TALAS’ New Home!